What Makes a Good Disc Sander? 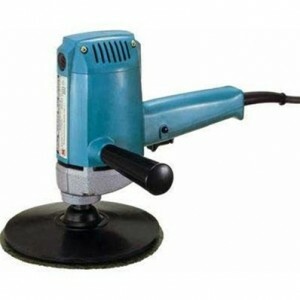 A disc sander is a power tool that is used for a variety of tasks including removing paint and rust from various items, preparing wood for refinishing, finishing and polishing items that have been refinished already and other similar jobs. This 7” sander has 6.2 amps of power with a no load speed of up to 4500 rpm. This high overload capability ensures that the disc sander doesn’t burnout during large projects where a lot of sanding is being done. The air deflector protects the operator from exhaust and debris and the trigger lock-on button reduces user fatigue. Another factor in reducing fatigue is the extremely light weight of the sander; only 4.4 pounds. The spindle lock makes changing accessories very fast and efficient. Holding onto the disc sander has a pistol grip and side handles that are covered with elastomer which is a soft material that makes it much more comfortable to hold onto rather than just hard plastic. 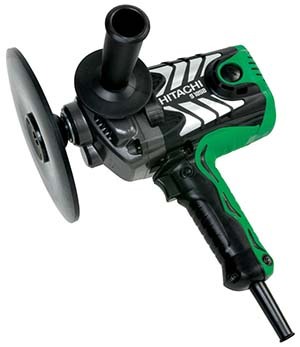 Hitachi is a well known and well trusted brand name in power tools with a reputation for high quality and high performance. 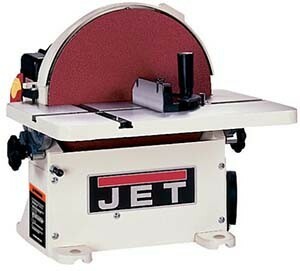 This disc sander is no exception, making it a popular choice among woodworkers and others. The vertical design of the disc sander provides the user with improved balance and control over the unit while sanding. Durability will not be a problem due to the construction and design of the Hitachi disc sander which include such features as double insulation, metal bearing bushing and a dust proof bearing chamber. These features are all part of what extends the life of this tool. The tail cover is wear resistant and also helps the performance and lifespan of the tool tremendously. 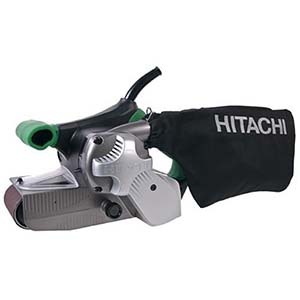 There are a number of applications the Hitachi S18SB Vertical Sander is used for. These applications include preparing and finishing wood for a variety of project types, removing paint and rust from metal and wood surfaces, making joints flush, polishing synthetic resins and sanding and polishing metal surfaces such as kitchen appliances, automobiles, and many other metallic surfaces. It is a tool that can be used by professionals and novices alike including contractors, construction companies, woodworkers, carpenters, restoration specialists, remodelers, DIY-ers, builders, automotive body specialists, and others. Disk sanders make fast work of most san ding jobs but you must take care to use them properly, as they can gouge the surface if not used with care. There are many features that a high quality disk sander possesses that make it an excellent tool to add to your tool box. One of the first things to look for will be power. When the disk sander has plenty of power, even tough jobs are more manageable. Different sanders will have different power levels so think about the types of jobs you want the disk sander for when you are shopping. Our pick has 6.2 amps of power with up to 4500 rpms, making it a great choice for moderate sanding jobs that require extended sanding time. Sanders can come in both cordless and corded varieties. Some people prefer one over the other, but what will deter mine which is the better for you is whether you want to worry about recharging batteries or if you need constant power being fed to the disk sander. The grip a disk sander has is also important, especially if you will be using it on a regular basis. You want the sander to be comfortable to hold and use. Soft grips are very good for reducing vibration which can be a real bother and increase hand fatigue. There are disk sanders that have palm grips, handle grips and some have a center grip and side handles too. One potential problem with palm grip sanders is that the handle will become hot during use and that can be very uncomfortable. Variable speeds are always preferable so you can choose what speed you use to sand your projects with. Faster speeds are good for tough sanding and removal of rust and paint from your projects. Slower speeds are perfect for finer sanding and finishing work. Trigger locks keep the sander locked in place in the on position so you do not have to continually hold down the trigger to keep it running. Having to hold the trigger down can cause cramping and tiredness in the fingers and hands and cause the sanding work to be uneven in spots. When it comes to choosing the top pick for disc sanders, there is a process that we go through to ensure we have chosen the one that will be the best value and have the best performance for your money. We start with general research and then move onto collecting the features and qualities that a high quality disc sander has. Next we look at many different blogs and magazines in the tool industry to get more information. The final step is to talk to professionals and experts that work with disc sanders every day. We get their opinions on what makes one disc sander better than another and then combine their advice with the customer comments of those who are using the sander and we make this information available for you. 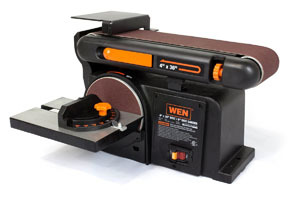 If you want to upgrade your disk sander to the best of the best, the Shop Fox W1828 is the way to go. The 1 HP motor has 110v and operates at up to 1750 rpm. The ball bearing construction is long lasting and durable and will stand up to the sanding jobs you want to use it for. It is covered with a powder coated finish for less scratches and marks and to protect against rust. 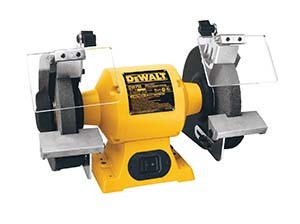 This disc sander is perfect for shaping and smoothing, squaring end cuts, truing simple and compound miters. This model uses 12” pressure sensitive adhesive sanding discs which you can find at almost any hardware or home improvement stores. One of the safety measures that the Shop Fix has is the paddle switch that will provide increased safety over the on/off switches that are present on other models. This has an oversized paddle and the lock out key is removable. Now you don’t have to worry about trying to find the off button. Just press the paddle down and the disc sander will shut off. There’s been a lot of attention to detail with this disc sander that has been held to a rigid quality control standard that assures reliability and safety when in operation. You will need to do several things to ensure that your belt sander stays in working order. Regular maintenance is paramount to keep the sander clean, running well and lasting a long time. The same is true for adhering to the safety rules that go along with using a sander. Following these rules helps reduce the amount of injuries and accidents that can occur from using the tool improperly. We’ve listed safety tips and maintenance tips below. Don’t wear lose clothing nor have your hair loose when operating the disc sander. Keep hands and fingers away from the moving parts of the sander. It may not look like it can do harm but it can take layers of skin off easily. Operate the disc sander at the rated voltage. Don’t use the sander if the housing is cracked or the handle is messed up in some way. Read all of the instructions and handling procedures prior to using the disc sander. Have an approved Hitachi service center repair and replace any parts that need it. When it comes to finding the right disc sander, the Hitachi S18SB is the perfect choice. With features that make fast work of sanding jobs big and small, it is a choice that you would want to make for your own workshop as well. Whether you’re removing paint and rust from metal shelving or patio furniture or sanding down the rough edges of a book shelf, you will know that you have a top of the line disc sander that will last you years. Make sure that you follow all the instructions for safety and maintenance and put the disc sander away when you are done using it. With the proper care, you won’t have to replace the disc sander every year. With Hitachi’s reputation for high quality power tools, you know you have a great choice that will stand up to the jobs at hand and pass with flying colors.